This Friday, March 20th, What Scene?, Broad Street Music Group (BSMG), and RECphilly will host the first Official Philadelphia Showcase at the South by Southwest (SXSW) Music Festival in Austin, TX. 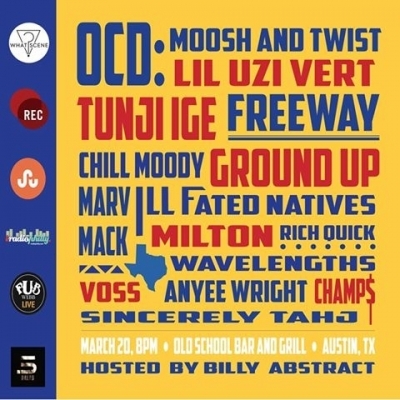 More than 400 people are expected to be at Trinity Hall's Old School Bar & Grill (an official SXSW venue), located at 401 East 6th Street, from 8p.m. - 2a.m. for the show. For Philadelphians attending the SXSW conference without conference badges, tickets are available for $10, at the venue. iradiophilly will also be on hand LIVE Broadcasting the Official Philadelphia Showcase down in Austin, TX on March 20th at 9/8c. You can listen to the stream for FREE at http://www.iradiophilly.com/phillyshowcase or on our free iPhone and Android apps.